Out of the three Valentine bubble bars of 2017, Lovestruck, Unicorn Horn and Ladybird it is unquestionably the most vibrant in colour. Before I had read what ingredients Lovestruck had, I imagined it would be a similar scent to one of the bubble bars that were an Easter release last year, Tweet. Described as a bubble bar that is ‘refreshing and citrusy,’ I couldn’t wait to get it in the bath! 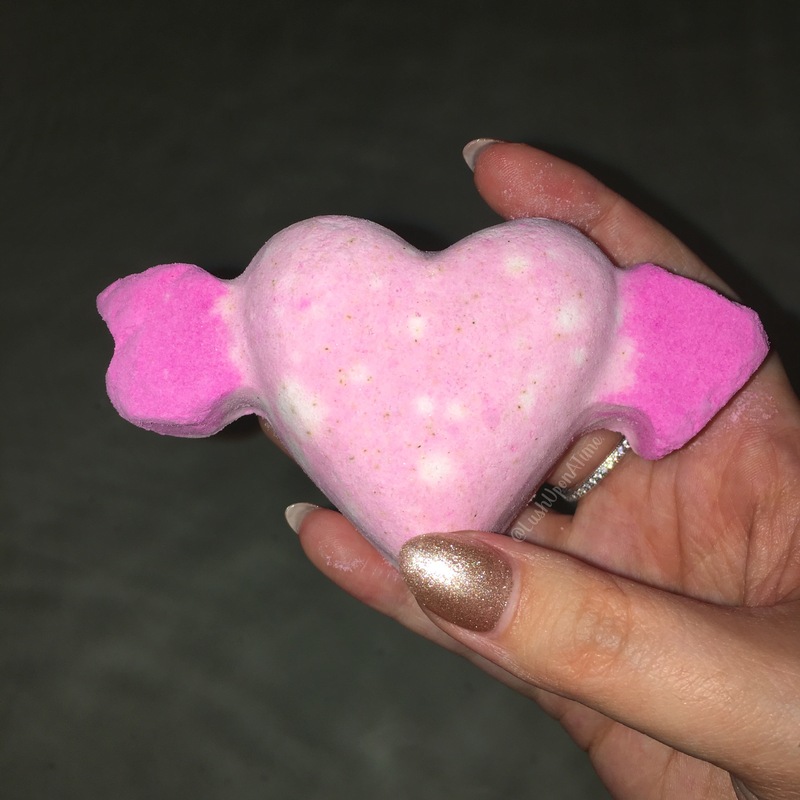 The first thing I noticed about the Lovestruck bubble bar was its size. It’s not as big as a Brightside or Comforter, but it’s quite close. If you managed to get ahold of a Down the Rabbit bubble bar last year I’d say it’s a similar size to that although to me it feels more stocky. The next thing that I noticed was that Lovestruck’s scent was the polar opposite of what I had expected it to be. The citrus element was barely noticeable, all I could really smell was the geranium oil in it. In a way it reminded me of the Ladybird bubble bar a little but, with a splash of bitter lemon instead of the peppermint. I really wasn’t sure on its scent but I felt the same way about the Ladybird bubble bar last year so decided to give it a go. A little of this bubble bar goes a long way, the smallest amount created mounds and mounds of fluffy white bubbles, the water was also silky smooth. It left my skin soft and hydrated. Which is everything I love in a bubble bar. I really couldn’t get on with the scent. Everything else about the bubble bar was however, perfect. For me the scent of a Lush product is really important to me so I won’t be getting the Lovestruck bubble bar again. I feel its scent is a lot like the Ladybird bubble bar purely because of the strength of the geranium oils scent in both. The peppermint in Ladybird seems to mask the geranium oil to a point that I can like it, the lemon in Lovestruck however doesn’t cut it in the same way for my nose. Personally I would have liked the Lovestruck bubble bar to not be packed with geranium oil as the Ladybird bubble bar has it in already, with them being in the same range I think I’d have preferred it if two products did not share such a dominantly scented ingredient. It’s a jackpot if you like the said scent. If you don’t however get on with it, it is quite the loss. Geranium just isn’t a Valentine’s scent to me. By all means the Ladybird and Lovestruck bubble bars are totally different. Lovestruck has lemon in it while Ladybird has peppermint, it’s just the one mutual ingredient of geranium oil that trumps me. It’s very rare for me to dislike a Lush product but Lovestruck sadly just wasn’t for me. I am however glad I tried it as it left my skin feeling fabulous and it is a really cute bubble bar. I’m a top Lush geek and really enjoyed getting photos of it, it photographs brilliantly and with its cute and wacky, bold colours I can still see it being very popular for those that don’t mind its scent. The Unicorn Horn Bubble Bar is the Lush product that I get the most excited about purely because of its name alone. Over the years it has been released several times as a Valentine’s Day special. Once upon a time it was not only stripey but also decorated with a sprinkling of stars. The stars have now sadly gone BUT without the stars the Unicorn Horn bubble bar is still one of the prettiest products I have ever used from Lush. I’m not sure what the connection of unicorns and Valentine’s day is but I’m not going to argue with it featuring in the annual Valentine’s Day range as I look forward to it after a long Winter, it reminds me that Spring is almost here. I am unicorn mad, I adore them and have done so ever since I was a little girl. The other half even lets us use unicorn bedding once in a while. He’s clearly a keeper. I just can’t help myself when it comes to unicorns. 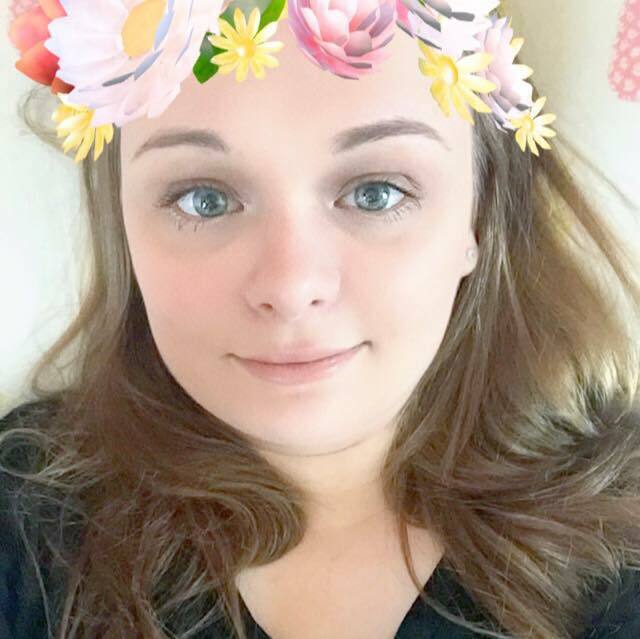 I just love the idea of a mythical creature living undetected in a beautiful forest filled with wild flowers, a spring and blissful bird song. Featuring lavender and neroli oil the Unicorn bubble bar has a cheery and relaxing scent. 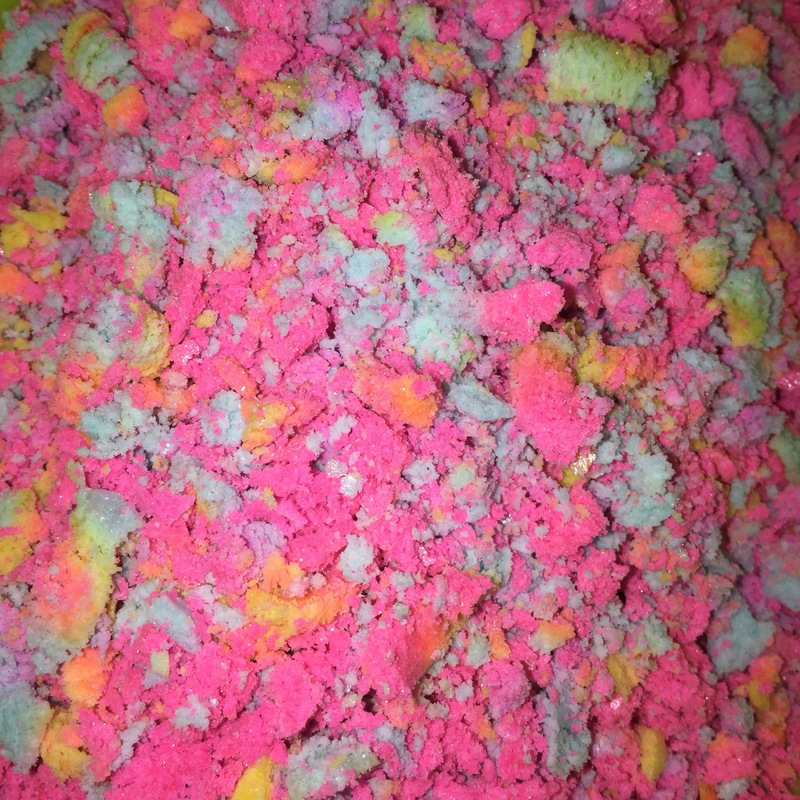 The smallest amount of Unicorn Horn bubble bar creates mounds and mounds of soft, fluffy and fragrant bubbles. A lot of people ask me how I use my bubble bars. Do I grate them? (picture above) do I crumble them in my hand under a running tap? do I use a sieve/tea strainer? My answer is I do all of the above, using any of the methods I have mentioned above always creates a huge amount of silky smooth bubbles. My advice is to do whatever works best for you. There is no right or wrong way to use it, grate, crumble or sieve. As a recovering(ish) insomniac I always seem to gravitate to the ‘night time’ products, most of the products that I class as night time ones are lavender based, the most iconic one for me being the Twilight bath bomb. The Unicorn Horn bubble bar works with so many other Lush products, my favourite Unicorn Horn cocktail bath is Unicorn Horn either with the Frozen or Lover Lamp bath bomb. Neroli oil has been scientifically proven to boost the level of serotonin in the brain a.k.a the happy hormone. Not only is the Unicorn Horn product a night time must have, it is also very good to use if you’re feeling a bit down in the dumps. This bubble bar is the perfect mix of floral and citrus-fruit scent. Beneath the thick, silky lavender and neroli scented bubbles is twinkling, soft-pink bath water. I never, ever use a whole bubble bar for just one bath as I don’t feel you need to, a little chunk of Unicorn Horn goes a very long way. If you’re looking for a quick and easy way to help you wind down allowing you to drift off into an easier nights sleep, look no further. I just love this bubble bar and I really wish it was permanent stock rather than just a Valentine special. We haven’t even finished the first quarter of 2016 and already Lush have brought out more new and exciting products than I can keep up with. We’ve had the Valentine’s Day range, the Mother’s Day range and of course the Easter range as well as everything else in-between. In all honesty I am literally stuck in a state of disbelief that we have actually already entered March?! As the saying goes – time flies when you’re having fun and with all of the new Lush goodies on offer, by me, fun is most certainly being had! 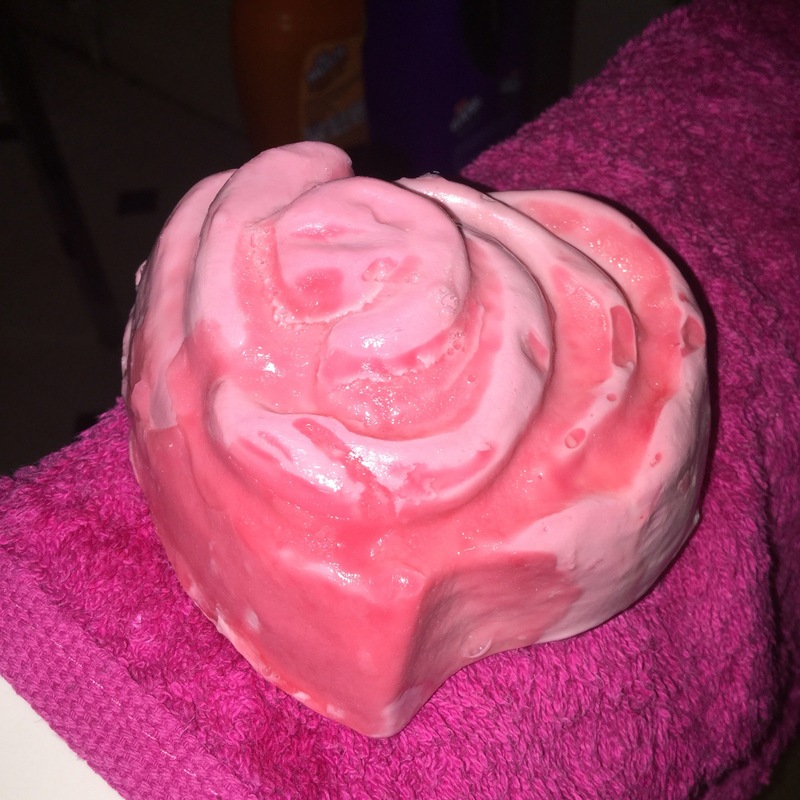 Today I am reviewing the Roses All The Way Soap, never before been released – this beautiful heart shaped, rose detailed soap had me intrigued within seconds of stumbling across it. The Roses All The Way Soap is a generous size that takes up the best part of my hand. Comparing it to the usual, rectangular soap slabs its unique design, size and shape make it a lot easier to grip when using it in the bath or shower. For me, as a disabled person my particular needs in a soap are catered for just on the fact that it is easier to grip. Until my Lush addiction hit me bad, I was never a fan of floral scents, I don’t know why but I had always associated rose, lavender and other flowery scents with getting old. Slowly but surely the Rose Jam scent however grew on me, alongside that, a lot of other scents that I never thought I’d enjoy all of a sudden became desirable. I’d go as far as to say that my sense of smell has matured since joining the Lush crowd. I am now recognising and appreciating scents I had never really taken much notice of before. Lush has opened my eyes and although I am still far from an expert when it comes to scents, I am getting better! Roses All The Way Soap is of course primarily a rose scent. 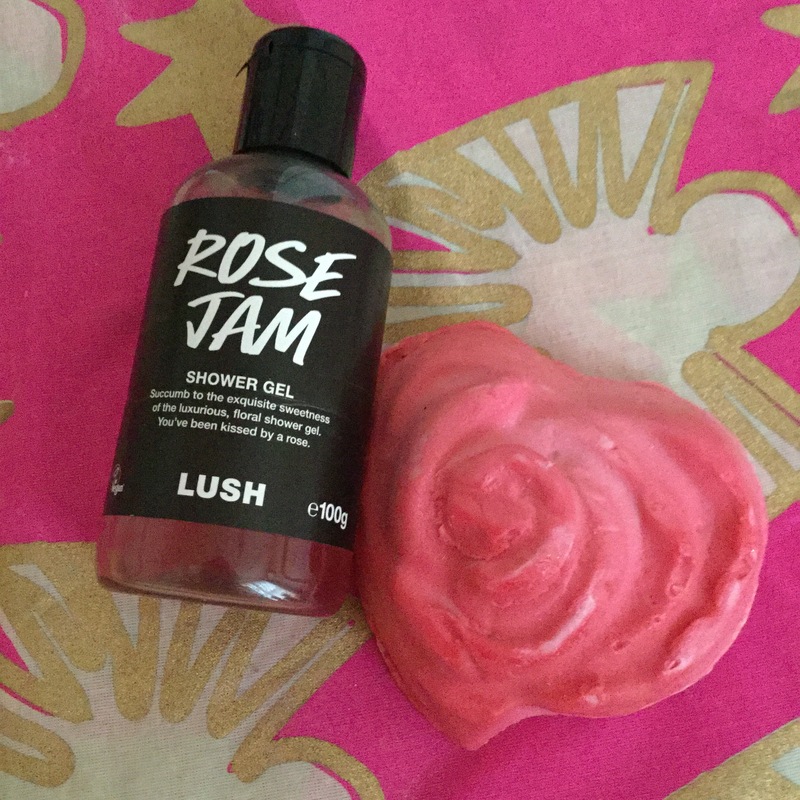 At first I thought it was the Rose Jam scent but after a while I realised it actually has a softer floral tone and is actually quite sweet, almost zesty. The more I used it, the more prominent the lemon oil in it appeared to be. The idea behind this soap was inspired by Alice In Wonderland’s ‘painting the roses red’ part of the book. The back of the soap is white, as you use it, its red side starts to turn a light pink, eventually fading to a bright white. Any one who is familiar with the Alice in Wonderland story will know that the Queen of Hearts angrily demands that all of the white roses in her court yard are to be painted red. Painting the white roses red is exactly what her pack-of-card guards set upon doing. Several hours after my bath I can still smell this soaps soft and zingy fragrance on my skin. It lathered up well and didn’t dry out my skin which has amazed me as most bars of soap do, especially those that are primarily floral. Overall I am really impressed with Roses All The Way, it’s a wonderful addition to the Lush Soap family. Since enjoying it so much I have made it my new Lush goal to try several more Lush soaps in the near future. Watch this space!